An engaging employee wellness program can bring about positive and lasting change that can benefit your workforce and your bottom line. But what is the best way to drive wellness success without burdening your team? Combining a proven approach with intuitive technology can help you create a culture of wellbeing that works for you and your employees. 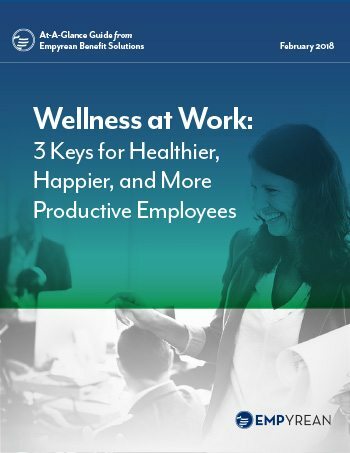 Empyrean’s latest At-A-Glance Guide to Wellness at Work explores three key insights for implementing, evaluating, and managing an engaging wellness program. Today, smart organizations of all sizes are recognizing that focusing more on employee health and wellness can help them be more proactive about these concerns. Your employees may want to make positive lifestyle changes, but many likely get frustrated while figuring out where to begin. With up to five generations among your workforce,3 your wellness offering must be attractive and accessible enough to meet a wide variety of fitness levels and activity interests. People benefit from convenient technology that makes it easier to track their goals and measure progress. Likewise, integrating a comprehensive wellness program into your benefits administration technology platform can drive year-round engagement and bring your total benefits offering front-and-center. With wellness dashboards, participation and goal metrics, and incentive information directly available within your benefits portal, you’ll create a seamless one-stop benefits shop for your employees. And leveraging pre-established partnerships between leading providers can make this task much simpler, faster, and less expensive than you might think. Take a closer look at employee wellness programs with Empyrean’s new At-A-Glance Guide. This free guide will show you how to increase productivity, lower benefit costs, and keep your company competitive. Corporate wellness offerings are becoming must-haves for employees and their employers, and with good reason. However, you do not have to compromise convenience, effectiveness, or costs to deliver an exceptional experience and encourage a healthy workplace. Download the free guide and learn how to create a culture of wellbeing that works for you and your employees. “2017 Work and Well-being Survey.” American Psychological Association Center for Organizational Excellence. Washington, DC. May 2017. “Worker Illness and Injury Costs U.S. Employers $225.8 Billion Annually.” CDC Foundation. Atlanta, GA. January 2015. Moss, Desda. “5 Generations + 7 Values = Endless Opportunities.” Society for Human Resource Management. Alexandria, VA. June 2017. KrowdFit.com. KrowdFit, Inc. Bellevue, WA. KrowdFit.com: For Employers. KrowdFit, Inc. Bellevue, WA.